What is included with the Systems4Knees™ program? *In order to ensure proper sizing, you may have received a measuring tool and sizing & redemption instructions for the Systems4Knees™ compression sleeve. A shipping and processing fee may apply at the time of redemption. How does the Systems4Knees™ program work? Systems4Knees™ is a multi-modal system approach designed by a renowned orthopedic surgeon, Dr. Gregory Martin and a leading physical therapist with over 30 years experience, Bob Habib. This system, specially designed for the knees, incorporates Education, Nutrition, Fitness and Support into a simple program works from the inside-out and the outside-in to promote healthy knees. This one of a kind program supports cartilage and joint function, encourages optimal flexibility and mobility, and provides support and pain relief when you need it. Is Systems4Knees™ safe to use? All the elements of Systems4Knees™ are safe to use for most adults. We recommend that you consult your personal physician if you are pregnant, have allergies or have other medical or physical conditions before implementing Systems4Knees™ or any other nutritional or fitness program. How long should it take for my knees to begin to feel better? By following the recommended daily Systems4Knees™ program you should begin to feel the difference almost immediately. Each element of the system works with your body in different ways and each individual may experience benefits from the system at different stages of incorporating the Systems4Knees™ program. Aside from the benefit of Happy and Healthier knees, we are not aware of any side effects resulting from the use of the Systems4Knees™ program. Should you experience any indication that you are experiencing negative side effects from the use of any part of the program, immediately discontinue the use of that component and immediately consult your personal physician. 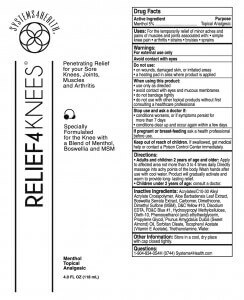 If you are taking prescription medications, please consult your personal physician prior to taking the Nutrition4Knees am and pm supplements or using the Refief4Knees menthol topical cream. If you are pregnant, please consult your personal physician prior to incorporating any of the Systems4Knees™ program. What are the ingredients in the Nutrition AM & PM supplements? 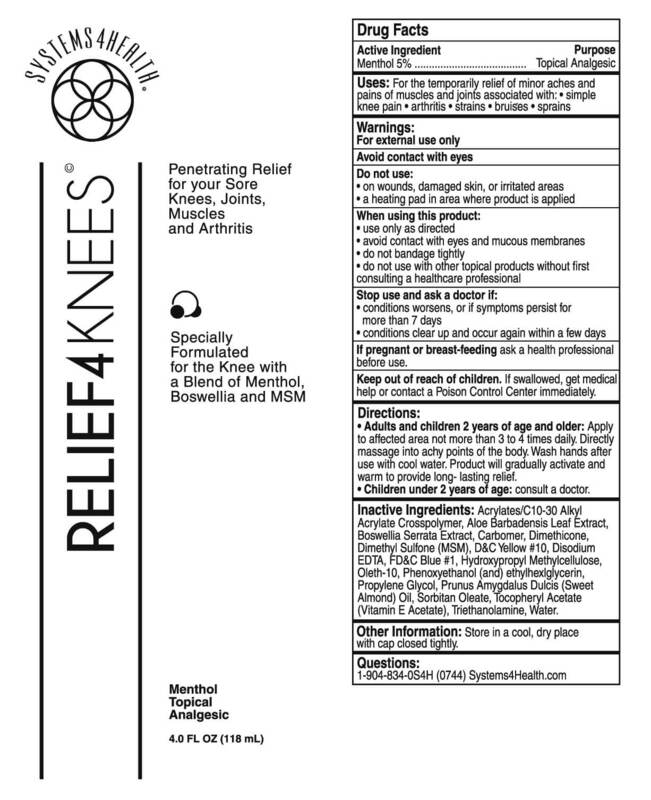 What are the ingredients in the Relief topical cream? 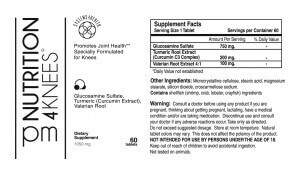 Menthol, Acrylates/C10-30 Alkyl Acrylate Crosspolymer, Aloe Barbadensis Leaf Extract, Boswellia Serrata Extract, Carbomer, Dimethicone, Dimethyl Sulfone (MSM), D&C Yellow #10, Disodium EDTA, FD&C Blue #1, Hydroxypropl Methylcellulose, Oleth-10, Phenoxyethanol (and) ethylhexglycerin, Propylene Glycol, Prunus Amygdalus Dulcis (Sweet Almond) Oil, Sorbitan Oleate, Tocopheryl Acetate (Vitamin E Acetate), Triethanolamine, Water. I placed an order for Systems4Knees™, when should I expect delivery? Systems4Knees™ orders are usually shipped within 2 business days of receipt in our shipping center. If you provided us with a valid email address at the time of your order you will receive an email confirming your ship date along with tracking information so you may conveniently track your order online. I receive my order and am missing an item(s). What do I do? Please contact our Customer Care department toll-free at (888) 561-5613, M-F from 6:00 am to 5:00 pm and Saturday from 6:00 am to 2:30 pm PST and replacement items will be shipped to you. Please contact our Customer Care department toll-free at (888) 561-5613, M-F from 6:00 am to 5:00 pm and Saturday from 6:00 am to 2:30 pm PST and they will be happy to assist you. We do our best to ship customer orders as quickly as possible. If you wish to modify your order and it has already been processed through our systems we will not be able to make changes to your order. What is the Healthy Knees 4 Life Club? The Healthy Knees 4 Life Club is a special membership program available to customers who have purchased the Systems4Knees complete program. As a member of the Healthy Knees 4 Life club you will automatically receive a new 60-day* supply of the Systems4Knees™ am & pm Nutritional supplements as well as the Relief4Knees menthol topical cream conveniently delivered to your door at a savings of over 35% of the normal reorder price. There is no minimum commitment and you can cancel at any time. As a member, you will also receive other special offers, updates and educational materials available only to the Health Knees 4 Life club members. *The quantity and shipment intervals of Healthy Knees 4 Life product offerings can be adjusted to meet your specific requirements. What if I want to return my Systems4Knees™ product? All Systems4Knees™ orders come with our No-Questions-Asked 60 Day Money Back Guarantee, less any shipping and processing charges. Simply contact our Customer Care department during normal business hours toll-free at (888) 561-5613 to receive a Return Merchandise Authorization (RMA) number and return address. 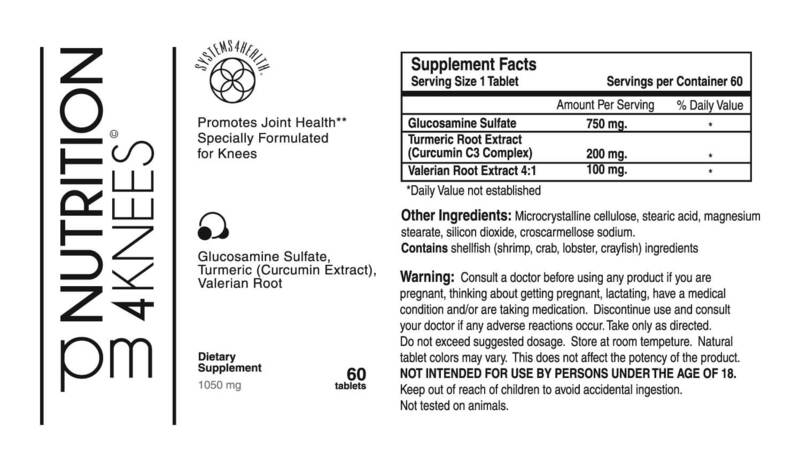 Return all items (including unused portions of Systems4Knees™ Nutrition4KNEES and Relief4Knees) in the original packaging with your RMA number clearly shown on the exterior of the shipping carton within 60 Days of your receipt of the order. Upon receipt in our warehouse your refund should be issued with 3 business days. What are you Customer Service hours and how do I contact the Customer Care department? You can reach our Customer Care department toll-free at (888) 561-5613, M-F from 6:00 am to 5:00 pm and Saturday from 6:00 am to 2:30 pm PST.